If you join a long meditation at the Acem centre in Berlin on a Sunday afternoon, you are likely to meet Daniel Roob, whose pleasant smile immediately makes you feel welcome. 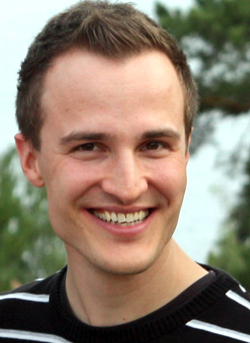 Daniel is 31 years old and a local organiser for Acem in Berlin. He is also a trained moderator, meaning he arranges M1 follow-up courses which give Berlin’s meditators the opportunity to meet, meditate and discuss their meditation. Lately he has joined the assistant instructor training course, with the aim of taking even more responsibility for Acem’s activities. In 2004, after five years in London, Daniel moved to Berlin. Together with a colleague, he is now building up a company specialising in web application development. Running his own business can be quite stressful, but while his external life is far from calm, he is pleased to have a method for stress management. His enthusiasm is contagious, and even his mother has become a regular meditator. Daniel is a creative and passionate person, and his interest in music has not waned. Diversity intrigues him, and he often pursues various interests simultaneously, whether in pop, jazz, soul, gospel or classical music. He sings regularly with an ensemble called The Jambalaya Gospel Singers, founded and directed by him. During an evening’s entertainment at the Halvorsbøle retreat, he sang his way into the hearts of the other participants, who were impressed by his genuine warmth and sincerity.